Hello lovely people. It’s been too quiet here. Had a back end issue with my blog which I eventually gave up on and then decided to email my awesome friend who hosts my blog and it was sorted in seconds (silly Hila, you could have been blogging up a storm). That means that I have tonnes to blog (yay!) and you, the awesome ones who are still here, will be flooded slightly. To start with I want to wrap up the last two GFWS posts with this one. 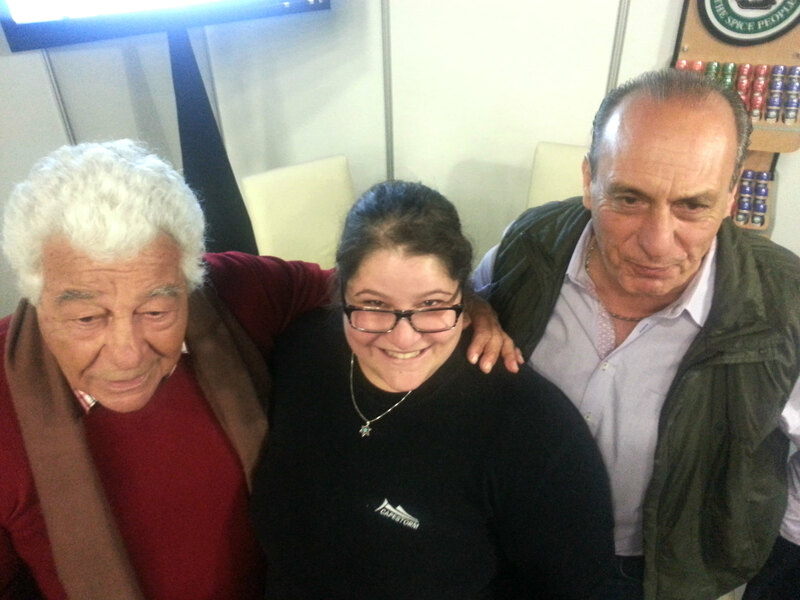 I was sooo soo lucky that my friend Tammy loves me lots and managed to squeeze 15 minutes of Antonio and Genaro’s time in my direction. I have written and rewritten this post a million times to try and convey what I felt from the moment Tammy said “Yes!” to the the very end of my time with them. I felt like a grade 1 on her first day at school, a teenager on her first date, like a winner being handed her prize in front of a crowd. These 2 gentlemen, who had previously just been figures on a screen who made me wish for Italy, were about to be real people. It sounds weird I know but even seeing them on stage at the GFWS, they were still “up there”. Definitely more real than a TV screen but still at a distance. The show was incredible. Their chemistry made their stage presence sparkle and the smell of the food was enthralling. As with their TV show, the recipes were amazing but the stories behind them were what transported me into a different world. Meeting them in person, wow that was something I just couldn’t prepare myself for. I was dumbstruck. I am sure I babbled for the first 2 minutes but they did not make me feel like anything other than a welcome guest. By the time my 15 minutes were up I felt super comfortable. Like I was having a chat with 2 uncles and I could see myself not leaving. In parting Genaro says to send you all love and adoration, my fans and theirs. They truly brought to reality the truth behind the secret ingredient to [Italian] cooking, good company.